Well, we have been hearing about fights and “phadday” between boys over girls and their issues. And let it be anywhere, schools, colleges, universities, a village, a pind, there has always been men fighting over girls. Yeah, it is like two male penguins fighting in front of the female penguin trying to attract her but no, that’s not how you attract a woman, dear boys. Try being a gentleman. An incident occurred in the Institute of Education and Research, The University of Punjab which was not really pleasant to see. But as we mentioned that we have seen men fighting over their girlfriends, this was quite the opposite. 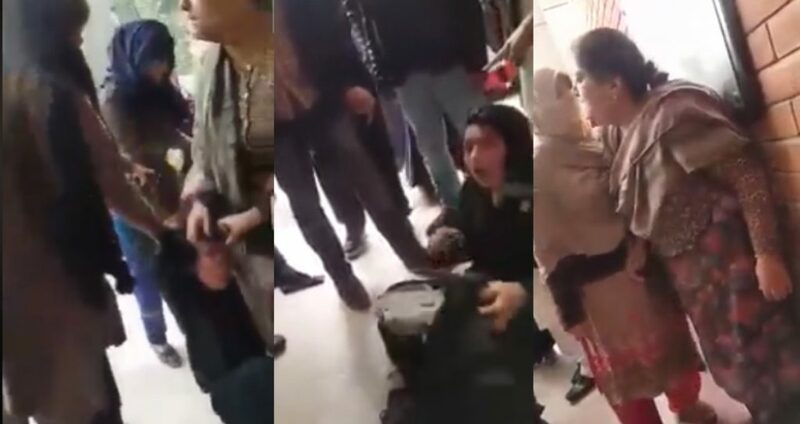 A video surfaced the internet of a woman being beaten up by several other women at the Punjab University in Lahore and it was not a very entertaining sight. According to sources, the whole fight happened because one girl “stole” the other girl’s boyfriend? Yeah, you heard it right. As you can see in the video a woman is being beaten up in broad daylight inside the University of Punjab and no one even seems to interfere until it gets really really bad. The girl kept screaming for help and nobody seemed to save her. As heard in the video the woman beating her claims that she has beaten her daughter and she has been hospitalized. Well, whatever the reason might be this seems pretty unfair and some even named it has a qayamat ki nishaani in the comments sections. This is not the first violent incident to have taken place in Punjab University Lahore. There have been many cases like these in the past too. So where does the fault lie? Who is to be blamed for such behavior? The administration for being so cool about it and letting it happen over and over again? Or the students who have taken in hand so much power that they think they can do anything on the campus and no one is going to stop them? Mirzapur effects perhaps and idolizing Munna Bhaiyya. Whatever it might be this needs to stop and no one needs to beat anyone let it be any reason especially not boyfriend-girlfriend issues.